The weight of the roller shutter is supported by an axial concealed inside a cell horizontally above the entrance. Microprocessor inside the control box received encrypted signal from the remote control, amongst other operation such as auto reversal upon obstruction and recognizing up to 16 remote control, opens or closes the door electrically with a motor. The gate opener only needs to overcome inertia and friction to move the gate. Gate can go up to 6 meter in length and 100 Kg in weight. Material can be stainless steel, wrought iron, brass, Aluminum or glass. Soft-start/soft-start and smooth movement at around 10cm per second. Space saving design, the whole shutter rolls up into a concealing cell. 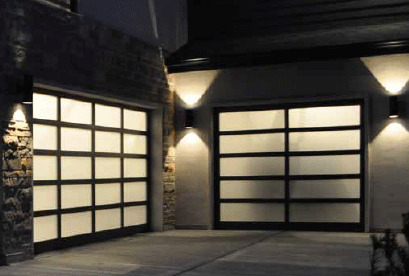 Modern over head garage doors have counter-balance spring and guiding tracks so that the opener only needs to overcome friction in order to open or close the door. Also, pulling the door along the center means better balance and stability. In contrary, rolling shutter has motor operating on one side only, causing instability and noise. In general, roller shutter garage doors are slower, noisy and more expensive. Because of these reasons, new houses built in the west today do not use roller shutter for garage door. However, we have installed roller shutter on drive-way where there is no roof and not enough room for slide/swing gates.